There is an increasing craze about eating gourmet food these days and everyone likes to experiment with continental cuisine in the kitchen - from house wives looking to cook something different for their families to working professionals indulging in culinary experiments over the weekends. So, Big basket is one such wonder online Grocery store which is fulfilling everyone's dream by bringing out-of-the-reach food ingredients to your doorstep, sitting in the comfort of your own house. 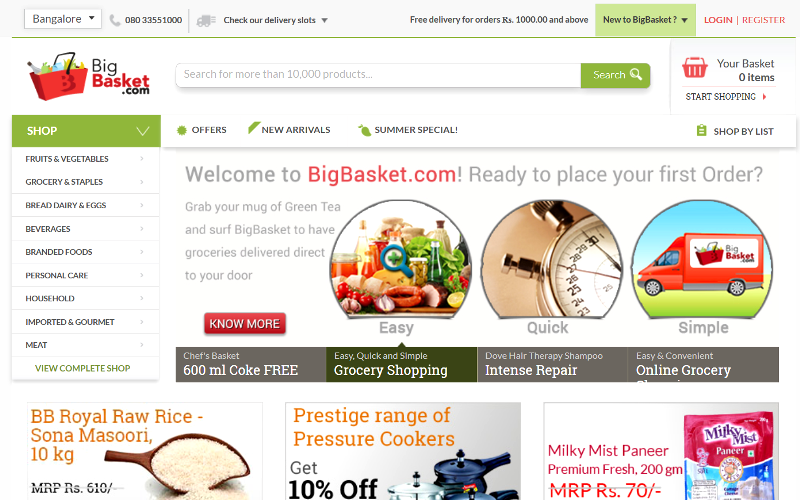 BigBasket.com (Innovative Retail Concepts Private Limited) is India’s largest online food and grocery store. With over 10,000 products and over a 1000 brands, you will find everything you are looking for. Big basket has a great collection of imported ingredients for the new age gourmet cook from sauces, preserves, pastas, breads, jams, ice-creams - the list here is endless. For those who love cooking Italian food, the imported and gourmet food section at Big Basket will be a great treat with a variety of imported noodles, pastas and pasta sauces. These sauces from renowned international brands are of the best quality with an assurance of freshness and good taste. Big Basket also has a large variety of fresh and dried herbs that you can add to bring out the flavors in your food. For those who prefer pre-mixed seasonings, they can choose from ready pizza seasoning, Jamaican jerk seasoning and even ready to use taco and fajita seasoning. Many times when someone is cooking a gourmet meal, the biggest challenge lies in procuring imported fruits and vegetables, however Big Basket endeavors to solve with challenge with their vast collection of delicious canned ingredients such as salmon, sardines, cherry tomatoes, oysters, peaches and a lot more. And after a meal if you are looking for finish up with some gourmet dessert, then big Basket has the answer for you with their wide range of ice-creams from globally famous brands Haagen - Dazs and London dairy. Available in a variety of flavors, these imported ice creams are a great way to end any meal and impress all your guests. In one words, Big basket has everything, from electrical appliances for your kitchen, household needs, books, magazines, school supplies till organic and international branded food products. So if you enjoy gourmet and imported food, then try registering for a Big Basket account for quick and easy delivery of all your favorite imported ingredients. Right now, they are only delivering in Hyderabad, Bangalore and Mumbai. Select a time slot for delivery while ordering online and your order will be delivered right to your doorstep. You can pay online using your debit / credit card or by cash on delivery. I think this is the best solution for today's busy lifestyle and Big basket is offering us a helping hand. I'm sure going to take this awesome help and I'll recommend my viewers from Hyderabad, Bangalore and Mumbai to check their user-friendly website for at least once. I'm very much confident that their service will definitely lessen up your stress and save you some quality time to spend with your family. So, try out BigBasket.com and share your experience with me. I am a regular customer and i definitely love their site..just would prefer the free shipping is for orders above Rs 500!!! Good but just same as buyinbusget grocery store open in jaipur rajasthan . its also provide the free shipping charge . ..Welcome to visit my site!.. Nice and interesting posting about leading online grocery shopping. It is the ease and convenience of Online Grocery Shopping Store that is wooing more customers to the virtual stores.